← OMG I actually cooked on my own! I thought my graduation present from my parents was their visit to Vegas and maybe they would slip me some extra cash. Little did I know that the ipad2 I had been coveting since it came out in march was soon to be mine! When my mom pulled the iPad box out of her bag, my first thought was why does my mom carry her iPad box around with her, I bought her a very nice case when she got hers for Christmas last year. Then a lightbulb clicked and I think I was in shock for a good ten minutes or so. I couldn’t do much with the iPad until I got it home to my laptop to get it all set up. Cool thing about apple, whatever apps you have bought thru iTunes for your iPhone (or any free ones) are automatically put on your iPad. Some of the apps I purchased the iPad version because the picture quality is better. 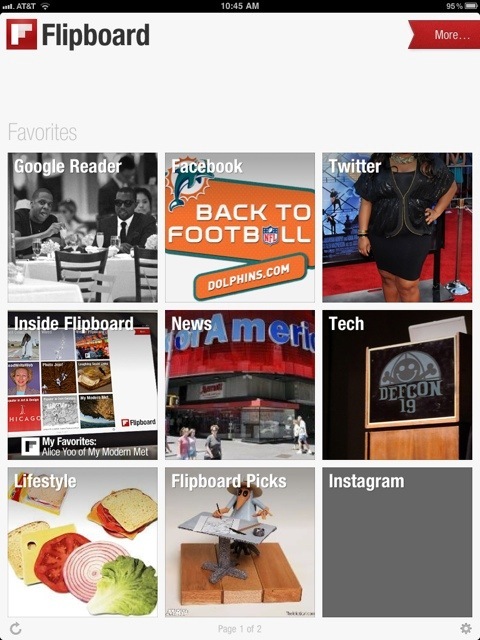 If anyone has an iPad I wanted to give you some of my must have apps, the first Flipboard! The concept behind Flipboard is to have a social magazine on your iPad. What I love about it is that I can set up google reader, Facebook, twitter and a bunch of other social media sites and flip through everything like a magazine. It puts everything in one place. I love the google reader aspect the best. It puts all my favorite blogs in one place and I can either flip thru blog by blog or choose what blogs I feel like reading. To move from page to page you swipe the screen like you’re turning the page of a magazine. 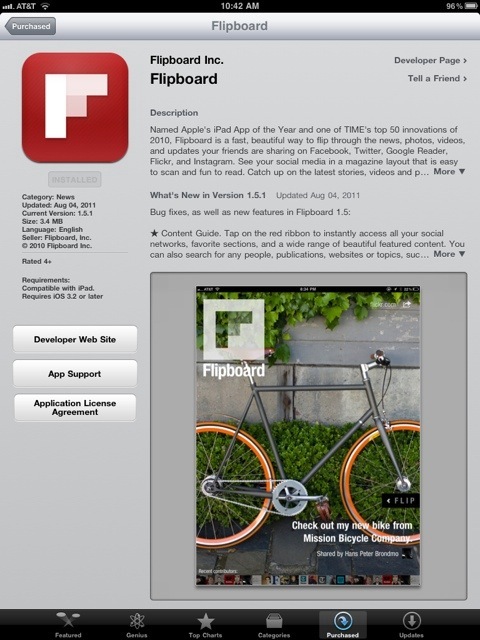 You can see the description of Flipboard in the app store. That is a screen shot from my iPad. The quality on the screen is amazing! This is my first of two pages on Flipboard. I also have added different news features, magazines and other content to have all in one place. Also this app is FREE! It’s really something that keeps me updated and it’s the first thing I check after email when i wake up in the morning. Other apps that I love are the find my iPhone app and the wordpress app. The find my iPhone app connects to my iPhone and my iPad and from either app ( or online ) I can locate where either one is. I can remotely wipe the data from either device if it ends up stolen or lost. I can send messages to the devices or make them play a sound if I can’t find them. It’s nice for forgetful people who can’t remember where they left something. I am currently writing this post on the wordpress app on my iPad. It’s simple and easy to use. This gives me the flexibility to blog without having to lug my laptop around. And if you’re looking for fun games I recommend words with friends, fruit ninja and angry birds. I was kind of over words with friends but when I got my iPad it renewed my interest in the game. There are so many fun accessories for the iPad and I can’t wait to have a job so I can buy some! I really want a wireless keyboard to make blogging easier from here and to not have to take my laptop on long trips anymore. I love my cases, I have the smart cover for the front, but I felt like if I dropped my iPad it would still get messed up, so I purchased a cover for the back from casemate that covers the back but is compatible with the smart cover. I love it and now I feel like I can actually leave my apartment with my iPad and not break it. It was such a great surprise! If you ever get an ipad you have to get it! It’s like flipping through a magazine. That is such an awesome graduation present! Omg I would love to have an iPad. For now, I’ll just have to deal with my macbook and my android. But I do love both of those :). Have so much fun playing around with your new toy! Thanks! I feel like a crazy apple person, I’ll be on my couch with my mac book, iphone and ipad. One app I didn’t mention is this nike training app which is free and gives you a bunch of different styles of workouts, I could see you really liking that!